"Tess, you know you don't get anywhere in this world by waiting for what you want to come to you. You make it happen." Tess McGill (Melanie Griffith) joins the masses of office employees on the Staten Island Ferry towards downtown Manhattan. She sports huge blond hair, a shabby wardrobe, and tennis shoes (for easier walking). This is not the typical, serious image expected of the Working Girl of the 1980s, and it hinders her progress in the workplace. Instead, the chauvinistic males treat her like a joke and show no respect for her career ambitions. Tess has more intelligence and knows the material, but can't discover the avenue to success. Will she remain a secretary for the rest of her life? Without a stroke of luck, that could be her destiny. Through the opening credits, the camera pans over the skyscrapers of New York City while a rousing tune about the "new Jerusalem", plays. For countless people struggling like Tess, this metropolis does represent the holy place they're all striving to reach. Unfortunately, many must perform the simple, mundane tasks without hope of advancement. Tess appears to face the same situation, but then a freak skiing accident sidelines boss Katharine Parker (Sigourney Weaver) and places her in charge. Actually, Tess isn't really given the job, but chooses to play the role after she realizes Parker is trying to steal her ideas and pass them off as her own. This opportunity may change Tess' life, but first she must pass herself off as management, and that will require major changes. One of the highlights of Working Girl is watching Tess slowly begin to alter her mindset and realize she can accomplish more with her life. Her new persona relies on much more than a nice haircut or outfit, but instead stems from a growing confidence inside that amazing opportunities exist out there. Melanie Griffith wonderfully embodies Tess' initial frustration and eventual transformation by maintaining her fragile nature underneath her growingly confident exterior. Even when life is going well, everything is so fresh and dangerous that it could collapse at any time. Representing her old life is Mick (Alec Baldwin), her ex-boyfriend trying to win her back. While matching up nicely at one time, Tess has moved past his simpler ideas about life. However, he's always there to remind her of the eventual destination if her plans fail. The plot concerns Tess joining up with Jack Trainer (Harrison Ford) to set up a business deal with Orren Trask (Philip Bosco) - a friendly older man in charge of a huge corporation. In this quirky role, Ford brings a wittiness and fun to the role that's often missing from his comedic parts. His character recalls the charm of Han Solo with a new bumbling insecurity about his job failures. The comic spontaneity in several of his scenes really carries the film and keeps it from becoming too mundane. Ford and Griffith have a nice chemistry on screen, and it's easy to root for them to fall in love. 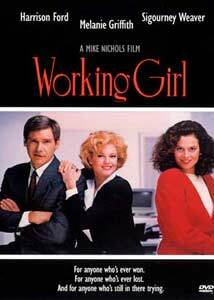 Working Girl lacks the depth or emotional intensity necessary to really draw us into the lives of its main characters. But it isn't trying to be this type of film. Instead, writer Kevin Wade (Junior) looks at the life of a professional woman in an enjoyable, light-hearted manner. While it's interesting to watch Tess evolve and become a confident person, the fun and romantic elements really carry the story. These characters possess the makings of real people, but the plot still falls into the easy-going Hollywood mode. Nevertheless, the impressive performances and creative dialogue make this film worthwhile and a nice experience. Image Transfer Review: This 1.85:1 nonanamorphic widescreen transfer works adequately to present the film without any major distractions. However, this picture is extremely mediocre and lacks the high level of brightness and sharp definition inherent in the best DVD transfers. These weaknesses could result from the film's age, but that fails to excuse it from criticism. I've viewed discs from much earlier than the late '80s that exhibit pristine transfers with amazing clarity. While the image lacks any major defects, it could have been much better. Audio Transfer Review: This is my first encounter with a 3.0-channel Dolby Digital transfer, and it appears only slightly improved from the Dolby Surround track. The sound field contains slightly more depth and force, and the quality of the material moves upward a little. When the rousing song blares over the opening and closing credits, this transfer nicely conveys the energy of the music. However, this occurs rarely due to the dominance of dialogue in the film. Overall, this audio track pales in comparison to the more complex 5.1 transfers, but it still provides a well-done listening experience. Extras Review: The supplemental material for Working Girl consists entirely of preview trailers and television spots. The disc includes two similar theatrical trailers, both presented in widescreen formats. The TV spots are the typical brief and silly promos designed to catch a viewer's eye quickly. Theatrical trailers also exist for 9 to 5, For the Boys, Nine Months, Norma Rae, and The Truth About Cats and Dogs. All are presented in widescreen versions except for 9 to 5, which comes in a full-screen format. There is also a "Fox Flix" DVD promo section that runs at the start of the disc, but luckily may be bypassed using the remote. Working Girl features Melanie Griffith's best performance of her career and contains excellent supporting turns from Harrison Ford and Sigourney Weaver. Although the story only scratches the surface of this environment, Griffith brings a tender, human element to her character and carries the film. The result is an enjoyable look at the professional struggles of a young woman mixed with romance.